Video Games Live has announced over 40 shows this year, giving game and music fans across the globe the opportunity to hear live videogame music performed by top musicians. 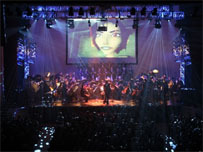 Video Games Live has been around since 2005, combining orchestrated videogame music with synchronized lighting, effects and other means of enticing the senses. Special performances will take place at the Game Developers Conference, San Diego Comic-Con, Leipzig Games Convention, Broadway in New York City and a 7,000-seat bullring in Mexico. Videogame music vets Tommy Tallarico and Jack Wall are the creators of the series, and also act as producers. Symphonies perform music from well-known games including the Mario and Zelda series, Halo, StarCraft II, Metal Gear Solid, BioShock, God of War, Guitar Hero, Splinter Cell, Castelvania and many others.